Sometimes it seems like all we do this time of year is visit with friends, eat sweets and enjoy a few cocktails. And then we realize all we are doing is visiting with friends, eating sweets and enjoying a few cocktails. Not bad, not bad at all…Actually, we are doing quite a bit of cooking, but it turns out that blogging about savory dishes in the midst of the holidays is tricky, too little natural light and too many people coming and going for good photos (we are not complaining, more time with friends is always better). Baking and cocktails are a bit easier to plan for, so with New Years coming, how about another cocktail? And the Black Velvet is a perfect cocktail for New Years. 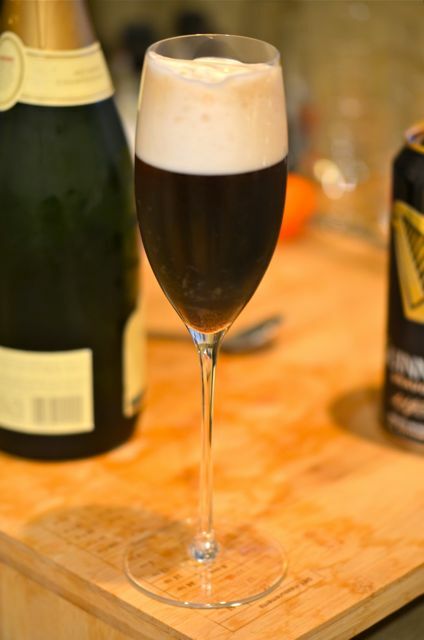 A simple combination of equal parts Guinness stout beer and good champagne or sparkling wine, the Black Velvet packs real flavor and depth, but without a lot of booze. A cocktail, but one that will keep you standing until midnight (or 9pm, we cheat and use east coast time, then we go to bed…we save our “humbug” for New Years). 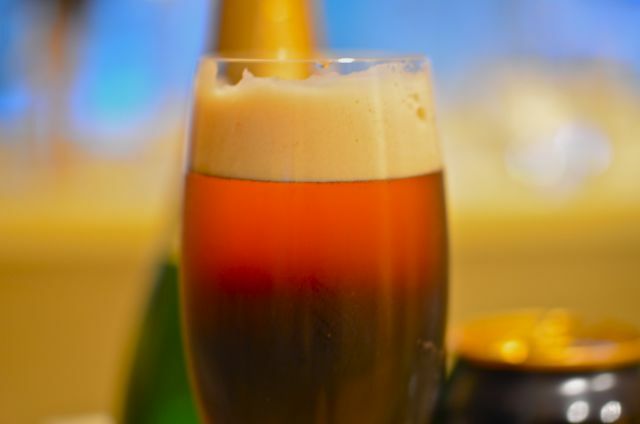 While you might not expect stout and champagne to work together, they are a very surprising match. 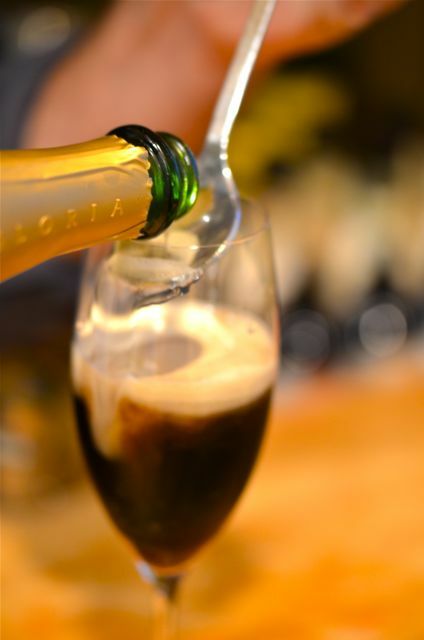 The stout adds body and some roasted and bitter flavors to the crisp, yeasty and fruity notes of the champagne. You get a sip you can savor from beginning to end. The Black Velvet is also beautiful, and as it turns out, fashionable. Let’s start with the looks. If you first add the Guinness and then slowly add the champagne (a spoon helps here) the drink will form two layers, the top a bit rosy and the bottom black. 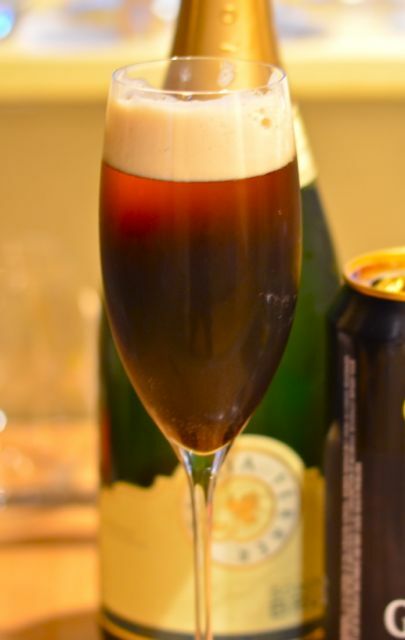 The layers will meld over time, but the almost-black drink in a champagne flute is stunning. As for the fashion, beer-based cocktails are all the rage in mixology these days and the Black Velvet is a very good introduction. And since part of the fun of cocktails is the conversations they start, if you add the looks with the trend and then the back story, the Black Velvet is a sure conversation starter. The back story? Most histories agree that the Black Velvet was created at the Brooks Club in London in 1861 to “mourn” the death of Prince Albert. Some suggest the cocktail symbolizes the black armbands worn by mourners. 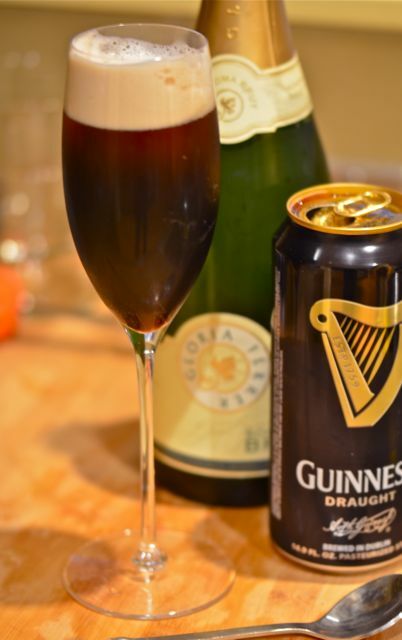 Some, like David Wondrich, suggest that (just maybe) the Guinness was a way to mask the drinking of champagne, which would have been very tacky right after the death of the prince. We bet both are right, the only question is the relative order of the explanation. We have our guesses, but either way, we get a good drink out of the deal. And even if the Black Velvet came from an “ending”, it is a lovely cocktail to celebrate the new year. Beautiful and flavorful but light on alcohol and with a great story attached, the Black Velvet is the perfect drink for a long night with friends. Happy New Year! Filled a chilled champagne flute or tall Collins glass halfway with the stout. Wait for some of the foam to subside. Very slowly add the champagne (use a cocktail spoon on the inside of the glass, if you like) until the glass is full. Serve. I’ve actually had this one before and it’s lovely:-) Always especially enjoy your cocktail posts. Have never heard about this cocktail … very interesting – but the Guinness will probably make me sick as a dog. So I will take my glass of champagne with my first breakfast for 2013. I wish you both a Fantastic Ending with a gentle beginning. Delight yourself. Nothing wrong with champagne just by itself….happy new year! Had it this morning … or lunch … slept in – still make me feel good … and never has the laundry hours been this great. *smile Happy New Year. Love David Wondrich! And love Black Velvets! Guinness and champagne is surprisingly delicious. Wondrich really is something…we love his books and Esquire articles. This does sound very interesting! And you’re right about it being beautiful. I noticed that right at the start. Wishing you a very happy new year, filled with good health and many joy-filled moments! Thanks and a very happy new year to you and yours! Great minds think alike when it comes to bubbly this time of year. Looks interesting! Happy New Year from Annapolis, MD! I know you are already knee-deep in accolades (and deservedly so!) but I still nominated you for the Versatile Blogger Award. Being such a blogging novice, I have no idea how to link to the award from your comment section. So you’ll have to jump from my site, or just look it up on the web. I have enjoyed your posts and your philosophy on food and drink and joy so much this year!